As Frank Lloyd Wright said, a design grows from simple to complex. It’s the same for the evolution of an architectural firm. You start with some simple work and as your firm grows, you move on to much larger scale and complex building types. Mojo Stumer Associates, p.c. now has the opportunity to show Long Island our talent on the most sought after of commissions- an art museum. 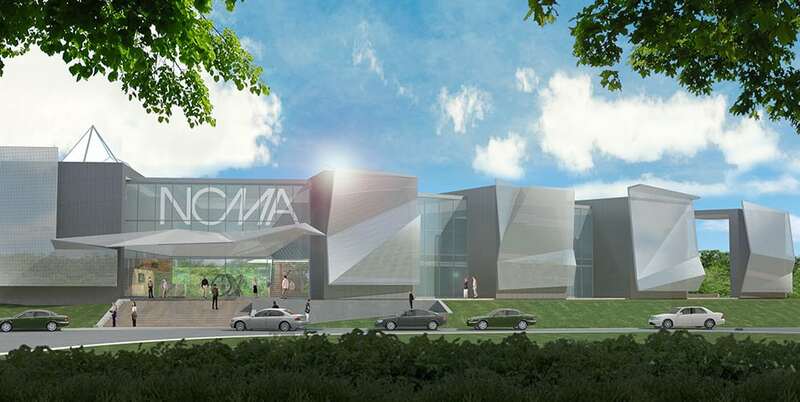 The Nassau County Museum of Art, NCMA, is a challenge that has been met head-on, with cutting edge design that will represent the future direction of art and architecture in Long Island. The existing Arnold & Joan Saltzman Fine Art Building, in Roslyn Harbor, currently shows private collection & foreign art and is host to many Long Island events. The new contemporary addition is being designed to showcase more collections and accommodate larger scale functions. 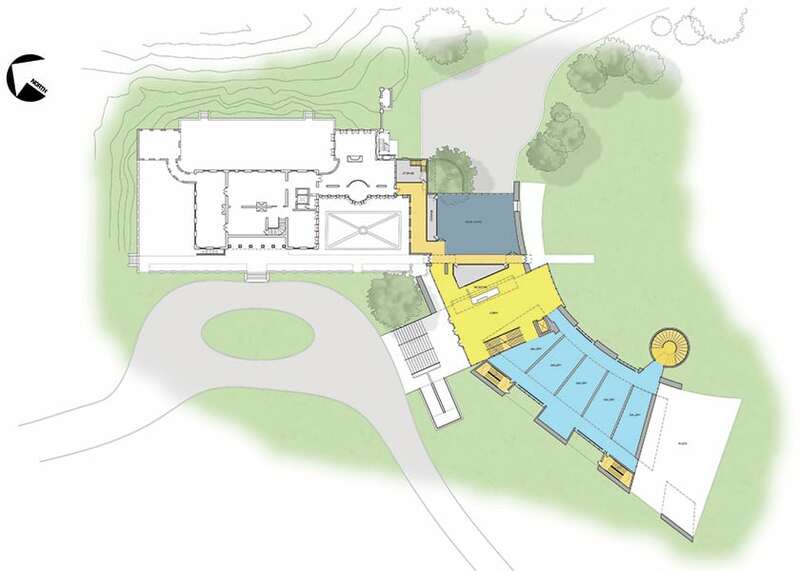 The lower level of the new design features a state of the art auditorium with seating for over 100 guests, 5 large galleries, a museum shop, as well as access to the vast east lawn area, which will also be used for sculpture art. The second level also holds 6 more galleries and administration offices. 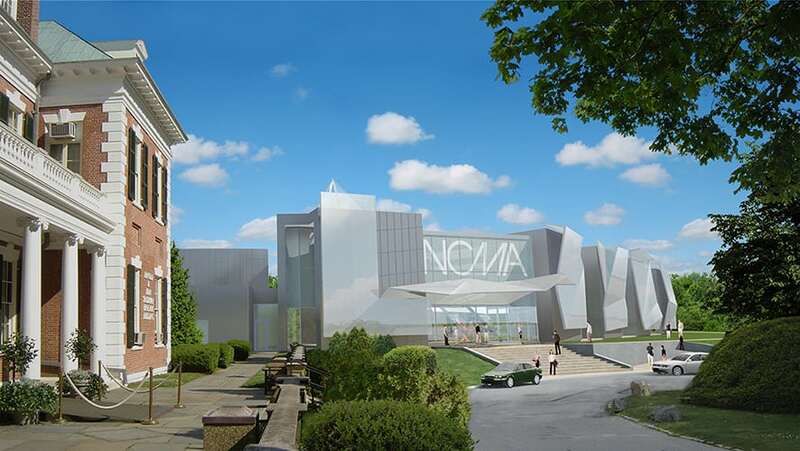 The new NCMA rises out of the ground like a colossal sculpture of glass and metal. A radial plan was created for the new steel-framed NCMA, with the intention to cast focus on the contrast between the monochromatic crisp building and the serenity of the verdant landscape. The building will be environmentally responsible; sustainability and LEED dictating the direction of materials and technology used. Incorporating art into the physical design was imperative. 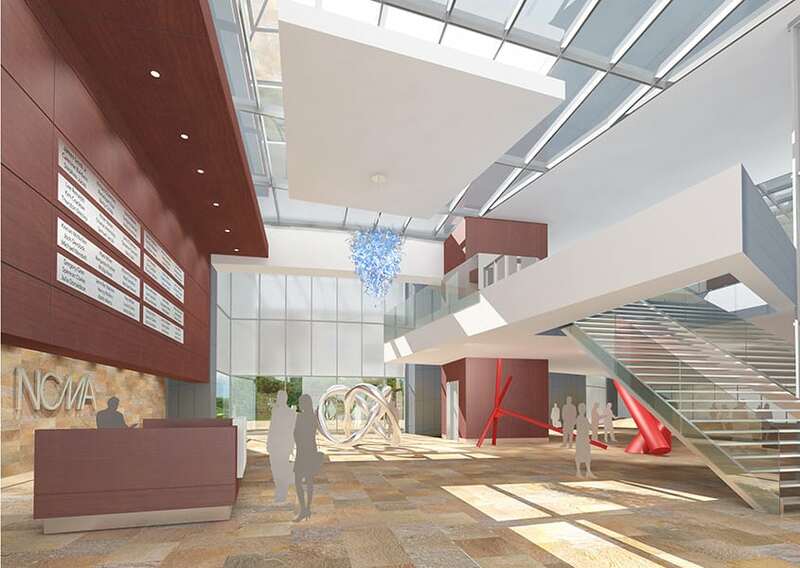 An ornamental cone staircase in the rear of the building and a towering translucent lobby level are only the beginning. Metal mesh clad art pieces were fashioned on to the façade, giving the structure movement and depth; indeed, it will be a sight to see. The NCMA is a sum of its parts; home to priceless works of art and a work of art in its own right. 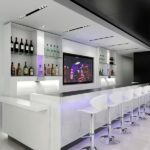 Simple beauty with complex architecture is the premise of this step ahead in design, brought to the residents of Long Island by Mojo Stumer Associates, for all to enjoy.